Infinity pools, which look like pools that are merging into the ocean or the surrounding landscape, are usually man made. So when you find a natural infinity pool like this one, the effect is magical. Surrounded by rock on all sized but easily accessed by a dirt road, the pool looks like a jewel enclosed by the earth. The first thing to do is to take in the views from the top of the rock wall. Only then go down to the pool for a swim. And while such pools usually have a hard or rough bottom, this actually feels carpeted.. But wearing shoes or slippers is still recommended. This is on Nusa Penida island. A dirt road goes all the way down to the beach. A motorcycle is recommended. How popular is Angel's Billabong? People normally club together Broken Bay and Atuh Beach while planning their visit to Angel's Billabong. People also prefer to start their day with Angel's Billabong. 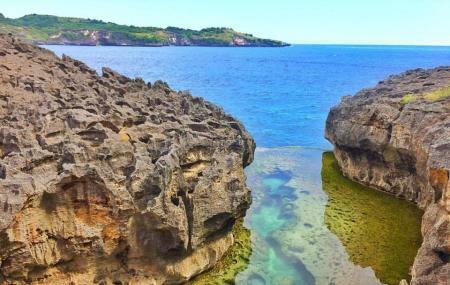 An amazing place that you won't want to miss when visiting Nusa Penida. The stream from the ridge pours into a lagoon which stands higher than the sea level. That lagoon is quite still and its water is crystal-clear. Just below the lagoon, waves hit the rock making emerald sea foam. Taking photos here in a sunny day is the best. Amazing landscape. Abit of a drive to get there but definitely worth it. Stunning views of the ocean and we also managed to see a few manta off of the rocks in the deeper water. Nice place to spend your time with sunset view or just sit down on the coral reef enjoy the ocean wind blows on you. This is beautiful Indonesia. Love it. Really cool place to visit and hangout with friends. Awesome picnic spot with serene views. It's beautiful how a natural pond is made between rocks edging to open sea. Trippe view! Very beautiful view. Nice place to take photos. And nice place to go walking but no swimming here. The road is not smooth. You need much efforts to get here by car or scooter.